(Host) Canadian Prime Minister Stephen Harper was returned to power in this week’s elections, but not with the majority he had hoped to win. 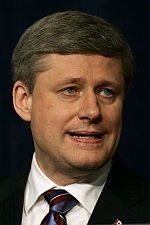 Harper’s Conservative Party gained ten to 15 seats in Tuesday’s election. But the Conservatives fell short of the 155 seats that would have given it an outright majority in Parliament. Antonia Maioni (my-own-ee) is director of the Institute for the Study of Canada at McGill University. She says Harper gambled by calling early elections and didn’t gain much. (Host) The Bloc Quebecois maintained its hold on power in Quebec, winning 50 of the province’s 75 seats in Parliament. Maioni says she doesn’t anticipate many policy changes in Harper’s new term. But she says the results of U.S. elections could have an effect on Canada. (Host) Maioni says Canada has begun to feel the effects of the global financial crisis. She says that could affect Harper’s government and its relationship with the U.S.